Eco Building Products, Inc. (“Eco Building” or “the Company”) is focused on developing safe, sustainable, and affordable solutions that address today’s lumber industry challenges. 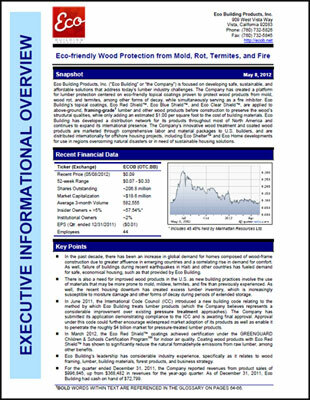 The Company has created a platform for lumber protection centered on eco-friendly topical coatings proven to protect wood products from mold, wood rot, and termites, among other forms of decay, while simultaneously serving as a fire inhibitor. Eco Building’s topical coatings, Eco Red Shield™, Eco Blue Shield™, and Eco Clear Shield™, are applied to above-ground, framing-grade lumber and other wood products before construction to preserve the wood’s structural qualities, while only adding an estimated $1.00 per square foot to the cost of building materials. Eco Building has developed a distribution network for its products throughout most of North America and continues to expand its international presence. The Company’s innovative wood treatment and coated wood products are marketed through comprehensive labor and material packages to U.S. builders, and are distributed internationally for offshore housing projects, including Eco Shelter™ and Eco Home developments for use in regions overcoming natural disasters or in need of sustainable housing solutions. * The Corporate Snapshot was last updated on May 8, 2012.